(Trent Nelson | The Salt Lake Tribune) Jenny Wilson announces her bid for the soon-to-be-vacant Salt Lake County Mayor seat of Ben McAdams in Salt Lake City on Friday Nov. 30, 2018. As multicolored Christmas lights sparkled on the trees behind her in the atrium of the Salt Lake County Government Center’s North Building on Friday, County Councilwoman Jenny Wilson announced her decision to run for the seat being vacated by Rep.-elect Ben McAdams. Fresh off a loss on the campaign trail for U.S. Senate, it’s an odd time of year to campaign, she conceded. If that race was a marathon, this bid is a sprint. And while she spent the Senate race trying to convince millions of residents across the state to cast their vote for her, this campaign is about roughly 1,100 central committee members in the Salt Lake County Democratic Party. This race is also about 2020. While Wilson is the first to declare her candidacy for county mayor, others are rumored to be considering a run for the seat, including County Councilman Arlyn Bradshaw. In a prepared statement sent to The Salt Lake Tribune on Friday, McAdams didn’t indicate whether he’ll support any particular candidate and instead praised the county’s direction under his leadership. During the half-hour news conference announcing her bid on Friday, Wilson looked back on her successes during her time on the County Council and promised to continue the work McAdams has started. Wilson in 2004 became the first woman elected to the County Council. She left the council in 2011 after an initial six-year term and successfully ran again as an at-large member in 2014. During her recent bid for Senate, which Wilson lost to Republican Mitt Romney, she focused on immigration policy and public lands, emphasizing her work on the county’s Jordan River Parkway. 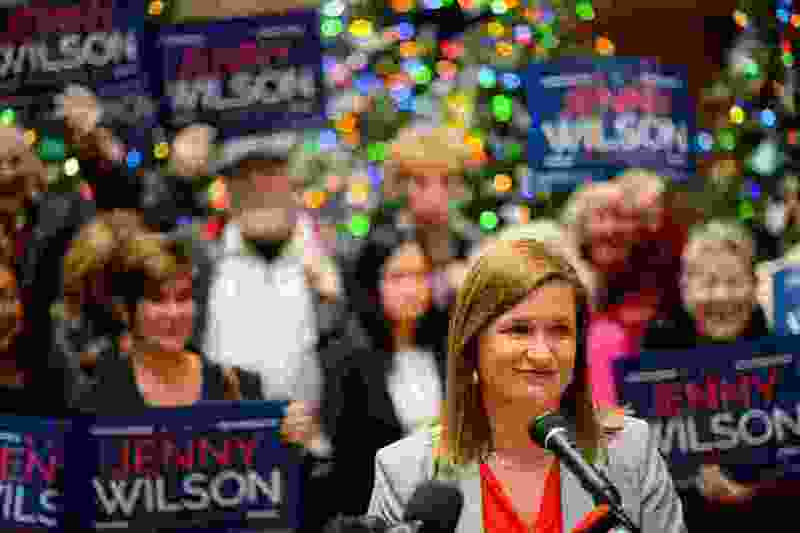 On Friday, Wilson presented a long list of items she would work on, if elected. Those include addressing the opioid epidemic, preventing sexual and domestic violence, seeking solutions to rapid growth, establishing affordable housing and working with Salt Lake County Sheriff Rosie Rivera to implement criminal justice reform. And as county mayor, she would be in the “driver’s seat” on the rollout of a number of new programs, including medical marijuana, new homeless shelters and Medicaid expansion, she said. “We have to give as much attention to any negative affects of an inland port as we do to the economic development," she said. As the central committee members begin to weigh a decision, Wilson said her history with the county and past engagement with these issues make her the right fit to carry out the last two years of McAdams’ term. But she won’t be calling undecided members Friday evening, she joked. Instead, she planned to take one night off from near-constant campaigning to watch the University of Utah football team play the Washington Huskies.